Ghana's Supreme Court has dismissed an appeal by the opposition to annul President John Mahama's narrow victory in last year's disputed election. The NPP had alleged that Mr Mahama won the election fraudulently, a charge his NDC party denied. NPP leader Nana Akufo-Addo told the BBC he was disappointed but accepted the verdict and urged his supporters to do likewise. Ghana is generally seen as a beacon of democracy in the region. The case was broadcast live on television and radio in a rare sign of judicial transparency in Africa, says the BBC's Akwasi Sarpong in the capital, Accra. Some 32,000 security officers were deployed across Ghana to prevent any violence. After the verdict was announced, crowds of governing National Democratic Congress (NDC) supporters emerged to stand on the court stairs, singing and waving white handkerchiefs. The court ruled that President Mahama had been "validly elected" after beating the NPP's Nana Akufo-Addo by 50.7% to 47.7% in the December 2012 election. Mr Akufo-Addo said he would respect the decision of the nine judges. "I urge all our supporters to accept the verdict - and in peace," he said. NDC general secretary Johnson Asiedu Nketia said he was happy with the verdict, as he knew the party had done nothing wrong. The ruling hopefully ends the anxiety hanging over the country for the last eight months, our reporter says. Ghanaians have been spellbound by the hearings, as such cases are not usually beamed into the homes of people, he says. The New Patriotic Party (NPP) had asked the court to scrap some four million votes, alleging the result was tampered with to guarantee Mr Mahama victory in the first round of the election. The NDC argued that any mistakes made by polling station officials while recording ballots was not an attempt to subvert democracy, and there were insufficient grounds for the court to overturn the result. 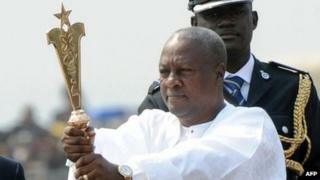 Despite the legal challenge, Mr Mahama was inaugurated in January.